Hop in the police helicopter and search for the crooks in their mountain hideout! Look, there in that opening. Is that a crook… in the tub?! Load the net launcher while you hover over the hideout and your partner rappels down beside the surprised crook. Go a bit lower and aim the net at the other crook trying to escape in the buggy. Oh no, watch out for that hungry bear looking for honey! Features a 2-level crooks’ hideout with bathtub, opening door, beehive and crane with chain. 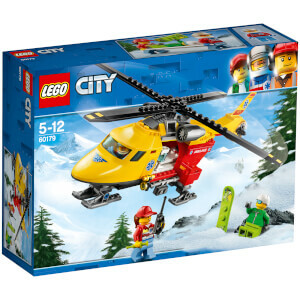 Also includes a police helicopter with double spinning rotors, net shooter and winch with string and hook, opening cockpit and sliding rear door, plus an escape buggy for the crooks with space for a backpack. Move the crane arm on the hideout to lower the backpack and loot to the ground. Hit the trigger on the net shooter to launch the net at the crook while the officer rappels to the ground using the winch and hook. Accessory elements include 4 water elements, string net, brush, mug, map, backpack and 2 money bills. This fun children's toy set is suitable for ages 5-12. Police helicopter measures over 5” (13cm) high, 9” (24cm) long and 3” (8cm) wide. Crooks' buggy measures over 1” (5cm) high, 3” (8cm) long and 1” (5cm) wide. Hideout measures over 5” (13cm) high, 4” (12cm) wide and 2” (7cm) deep.